e-Joy Computer desk is proud to present this brand new computer desk with multi-purpose usage. This desk provides additional space to work, without making a room look clunky, but instead it gives your home/office a stylish look. It allows you to work on your computer with multiple postures. 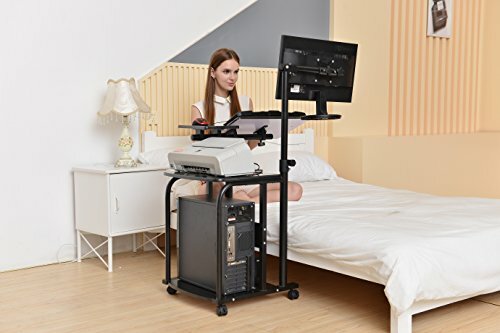 You can stand, sit and even lay down on bed to conduct your computer work or play games. The desk is made out of smooth vinyl surface and sturdy materials to support accessories for your work desk. You can attach a 27-30 inch monitor in this desk to perform your work. The table has heavy duty and durable construction. Beneath the desk an additional platform is provided to support a computer tower. This desk will complete your home or office with its convenient design and chic look. Sturdy frame that is designed in an edgy architectural look to support all your office essentials. Wide work surface accommodates keyboard and mouse; 2 wheels and very easy to slide while safe to use and also convenient for storage or space saver. Height adjustable for seating & standing position; easily assemble the desk and also includes the necessary tools.